In this program she will speak both to beginners and to more experienced weavers. She will touch on what overshot is, and how the weave structure is accomplished through the threading and the treading. She also shows how varied overshot can be, depending on the colors, fibers and density of the weave. Samples of overshot, from traditional coverlet to more intricate modern applications, will be available to see and touch. 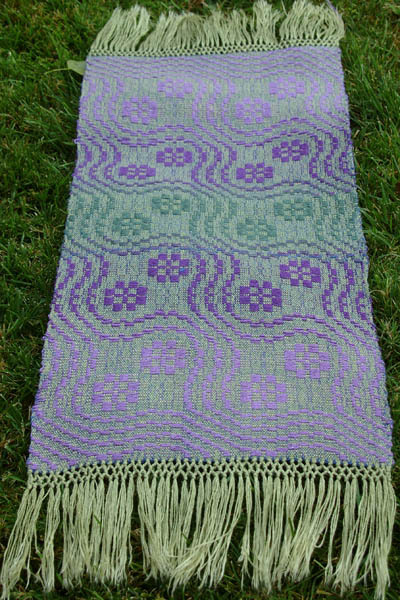 As a bonus, she will bring a loom to the meeting, warped with an overshot pattern so that anyone who wants to can give it a whirl. It could be a surprise to see how easily complex patterns can be accomplished with just four shafts. Dinner reservations will be made at Buck’s Restaurant on Woodside Road beginning at 5:30 pm before the meeting. All are welcome to attend, they are happy to expand our tables! Our meeting location in the Parish Hall at Woodside Church is opened about 7 pm. The program starts at 7:30 and lasts about an hour, followed by refreshments, then Show-and-Tell and a brief business agenda.